Praxis opened to the public on June 6. The open house included a community weaving and live music. A Cleveland fiber artist has found a way to share her passion for spinning yarn, dyeing thread and weaving fabric. 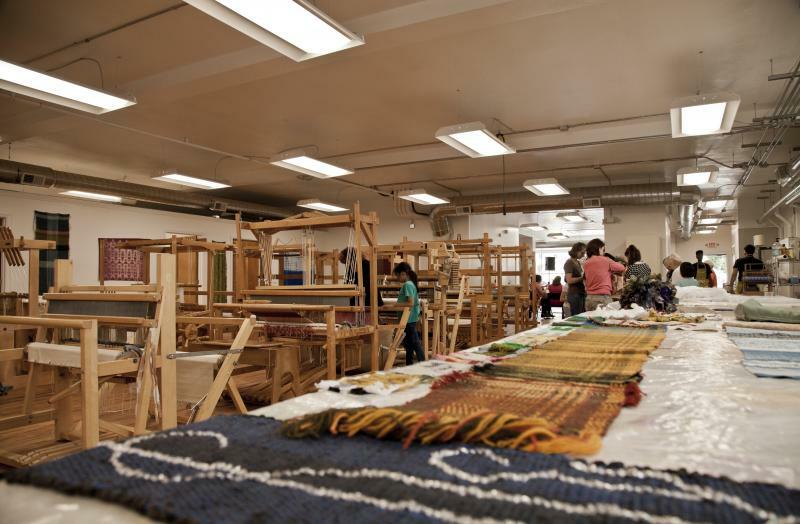 WKSU’s Vivian Goodman reports she pulled it off by finding a new home for the looms she loves. She found what she thinks is the perfect spot for art institute students and other artists to create fiber art, in Collinwood’s Waterloo Arts District. Some might call the new look of this Collinwood neighborhood a weirdly woven fabric. Art galleries, stained glass and design studios, indie record stores and a concert venue share the same sidewalk as sausage shops, a tattoo parlor, construction and industrial supply companies and the Slovenian Workmen’s Home. The housing and foreclosure crisis made it affordable for artists like Jessica Pinsky to move into the neighborhood. She loves its diversity. A lot of it is sad history. Like the 1908 fire at Lakeview Elementary that killed 172 children. Collinwood has always been a hard-scrabble working-class neighborhood, but along Waterloo Road, the arts have been a catalyst for businesses like the Beachland Ballroom, Brick, a cooperative ceramics center, and now Praxis Fiber Workshop. The 7,000-square foot space was originally a furniture store, then an indoor flea market. Since June, it’s been a place for art. So far seven weavers have joined the co-op. With key cards, Pinsky says they can use the equipment whenever they want to. But you don’t have to be a member to learn to use the equipment. Pinsky makes sure there’s always a loom with a weaving on it in the workshop’s picture window. When we visited last spring just before the grand opening, Pinsky was happily at work, winding a bobbin of thread. Once she snaps the bobbin into a gadget that looks like a wooden shoe (it’s called a boat shuttle), she can weave the weft through the warp. She plays the loom like an organ, pushing down repeatedly with one foot on something she calls a beater. But not everything’s done the old-fashioned way. There are also computer-assisted looms. Accomplished weavers can work here and display their art, and beginners can start to get the hang of it. Among those learning the craft at Praxis are Patrick Henry Elementary School students and victims of domestic violence. That’s thanks to grants from the Gund and Kresge Foundations. A lost art? Not the way Jessica Pinsky sees it. Pinsky’s hoping if the loom in Praxis Fiber Workshop’s picture window doesn’t draw them in, exhibitions will. The next one, by Praxis Artist-in-Residence Royden Watson, opens Friday, Feb. 5.